Pancakes are among our favorite breakfast/brunch foods to have on Saturday mornings when we have more time to relax instead of rush out the door to beat the traffic to work. We have cooked traditional buttermilk pancakes and sometimes others made with blueberries and poi before. But we love the ones made with mashed bananas the best because the pancakes are so moist and naturally sweet (we omit the sugar in the recipe). 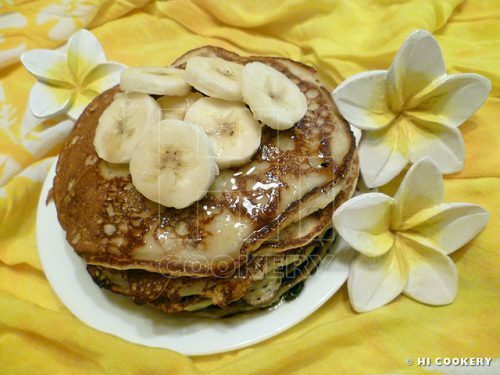 Banana pancakes are perfect for breakfast, brunch and especially National Banana Lovers Day. Peel and mash the bananas. Set aside. In a large bowl, combine the flour, sugar (if using) and baking soda. Add the walnuts (if using). Beat in the eggs. Pour in the buttermilk and melted butter. Add the mashed bananas. Mix well until moistened. Grease a skillet over medium-high heat. 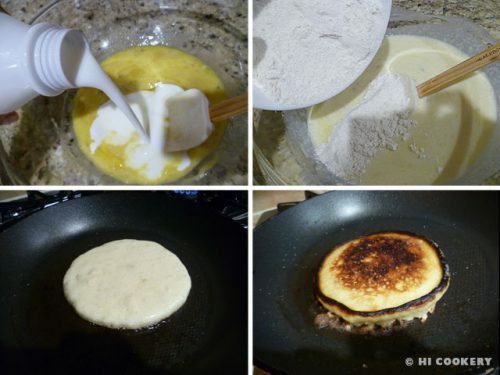 When hot, pour some of the pancake batter. Wait until it slowly bubbles and browns on the bottom before flipping it over to finish cooking. Transfer to a plate, keep warm and finish cooking the rest of the pancakes. Serve in a stack with a pat of butter, syrup and slices of fresh banana, if desired. Buttermilk can be made at home! Instead of the packaged product, simply mix 1 tablespoon of white vinegar or fresh squeezed lemon juice to 1 cup milk and let it stand for 5-10 minutes. Mix well before using in the recipe. Banana pancakes also may be enjoyed on September 26, which is National Pancake Day in the United States, and on Shrove Tuesday/Fat Tuesday, a movable feast day before Ash Wednesday, the beginning of Lent. We prepare these pancakes ahead of time and refrigerate them when we expect to have overnight guests. Banana pancakes are still moist and flavorful to heat up for breakfast the next morning, which is a time-saver! Love bananas like we do? 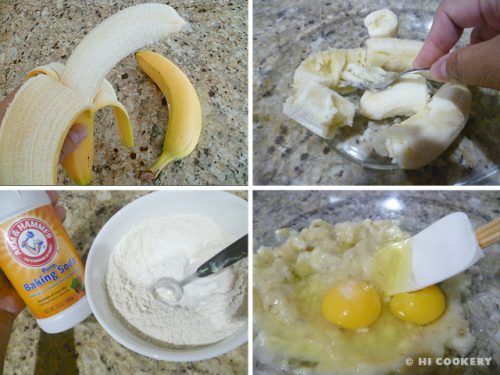 Look for other banana recipes by searching our blog.